In a recent post I described the concept of the Debt-for-nature swaps, which is, if well done, a win-win situation for a benevolent investor and a highly indebted government, as well as the future generations. But what happens if a highly indebted government, in urgent need of finances to sustain its sovereign debt, stumbles upon that one selfish investor that decides to use the indebted country’s resources for himself? Or worse, what happens if an indebted government tries to sell its natural resources to whomever simply to keep itself from defaulting? For example, Zimbabwe’s Prime Minister Mutambara tries to leverage its diamonds to reduce its sovereign debt by entering into deals with foreign firms. McDonalds is known to have converted large rainforest area to pastures or soya bean production, and it is unlikely that they received these rainforest areas for free. Selling resources per se is not the problem – most countries do this all the time – but it certainly becomes a problem if the money for the resources does not provide a service for the future generation. A sell-off of the natural resources reduces genuine savings, which is likely to leave the future worse off. 2. If a country really does default, then the investor in that country will receive the natural resources since it was the country’s collateral. Most investors are not the benevolent kind like Mr Bill Gates (Hello Mr Bill Gates, wink wink) and may thus simply sell off those natural resources to the highest bidders. These highest bidders are unlikely to be non-profit oriented organizations. An interesting research question in that regards would be whether there is a positive correlation between government debt and natural resources. This may suggest that a country with more resources may use these as collateral or may know that it always has a fallback option to sell that resources in order to pay off its debt. Summing up, using natural resources as collateral for government debt, or being pressed to sell nature to prevent sovereign default, may lead to a transfer of resources from a more benevolent owner to a profit-oriented firm that simply does not care about the future value of the resource. I do not see a useful (economic) solution in this case. One has to carefully weigh-off the current and future value of the environment with the cost of a government default or the higher, risk-adjusted interest payments on the sovereign debt. And one has to do this on a case-by-case basis. Our could do this based on the genuine savings indicator. HOWEVER, the problem is that if a country undertakes a debt-to-nature swap even with a benevolent investor, then the genuine savings indicator will count this as a reduction in that country’s natural resources. And it is also not entirely clear even how the genuine savings indicator should treat these resources then. Clearly, countries want to keep their sovereignity, and therefore international regulations that define rules for a potentially large-scale sell-off of natural resources in case a government uses these to reduce its risk of default are not the right approach. This is especially true since then no country should have sovereignity over its natural resources – I do not see an important difference between continuously selling off resources as every country does and a large-scale sell-off due to a sovereign crisis. If the optimal amount of nuclear energy is positive but only very few nuclear plants get build, then potentially no students will become nuclear engineers and subsequently human capital in this field dries up. As a result, nuclear power plants become less safe leading to a higher probability of disasters. He is absolutely right, but let’s think this further. Quite interestingly, if there is less human capital in the nuclear energy sector and this increases the probability of nuclear disasters, then this also has an additional feedback effect on the optimal amount of nuclear energy: It should decrease then! And that is interesting, since that means that fewer nuclear plants –> fewer researchers/ nuclear engineers –> higher probability of disasters –> lower optimal amount of nuclear plants –> fewer nuclear plants, etc… So the question is: since there is this vicious circle here and we can indirectly affect the optimal number of power plants by affecting the probability of a disaster, then really what IS the optimal amount of nuclear energy? Assuming this human capital channel is very large/important, then the following argument should apply: The more plants we build now the more students will become nuclear engineers, the lower the probability of a nuclear disaster and the higher again the optimal amount of nuclear energy. This feedback loop leads eventually to a very large amount of nuclear energy. Or, the other equilibrium will be that fewer plants are expected to be build, leading to fewer nuclear engineers and a higher probability of disasters and potentially a zero optimal amount of nuclear energy in the future. Thus, two equilibria are possible in this scenario, one with and one without nuclear power. However, I have to say that it is a strong assumption that fewer nuclear engineers implies a higher probability of disasters in the future. That should only happen if a) knowledge is lost or b) other engineers cannot quickly learn the existing knowledge needed for a nuclear plant. Since I am not an engineer, I don’t know how large the synergies or overlaps are with other fields. Finally, one way to break the vicious circle that leads to an optimal amount of zero nuclear energy is if the governments invest in (nuclear) human capital. Thus, if a potential nuclear engineer student knows that he will be paid (or get a job) by the government whether a plant will be built or not, then this should give enough incentive to keep that kind of (nuclear) human capital intact. It is certainly correct to emphasize that prizes have the potential to attract R&D directed towards clean technology. However, the one big problem with relying on prizes is that they provide money only ex post, if an innovation has been made and proven useful. But it is also true that R&D for clean technology often requires substantial finances up front. It is, therefore, more likely that prizes attract R&D activities on smaller problems that may be solvable without large up-front sunk costs than on bigger ones like car engine efficiency. Also, it may be questionable inhowfar prizes really provide incentives to undertake R&D activities. It may simply be that someone wants to make a certain process more efficient or attempts to find a solution to a problem without having been initially drawn to it by the possibility of obtaining a prize. This was, for example, the case for the development of the zeer pot. Clearly, it is unlikely that prizes harm incentives. However, one way to really increase the usefulness of prizes is to link prizes to specific research questions. Like this researchers will know what financial remuneration they may obtain in case they find a solution to that specific question. I have worked hard and finally here it is, a new working paper entitled “The endogenous formation of an environmental culture“. You can download the paper HERE. I have always been interested in studying the role of preference formation for environmental issues, and this new work is more strongly focused on environmental culture formation. In my opinion, the role of the preferences and their potential endogeneity to the states of nature has seen little to no analysis in the environmental economics literature. However, it should definitely be viewed as equally important as aspects of e.g. technological change or political ones. We develop an overlapping generations model with environmental quality and endogenous environmental culture. Based upon empirical evidence, preferences over culturally-weighted consumption and environmental quality are assumed to follow a Leontieff function. We find that four different regimes may be possible, with interior or corner solutions in investments in environmental culture and maintenance. Depending on the parameter conditions, there exists one of two possible, asymptotically stable steady states, one with and one without investments in environmental culture. For low wealth levels, society is unable to free resources for environmental culture. In this case, society will only invest in environmental maintenance if environmental quality is sufficiently low. Once society has reached a certain level of economic development, then it may optimally invest a part of its wealth in developing an environmental culture. Environmental culture has not only a positive impact on environmental quality through lower levels of consumption, but it improves the environment through maintenance expenditure for wealth-environment combinations at which, in a restricted model without environmental culture, no maintenance would be undertaken. Environmental culture leads to a society with a higher indirect utility at steady state in comparison to the restricted model. Our model leads us to the conclusion that, by raising the importance of environmental quality for utility, environmental culture leads to lower steady state levels of consumption and wealth, but higher environmental quality. Thus, for societies trapped in a situation with low environmental quality, investments in culture may induce positive feedback loops, where more culture raises environmental quality which in turn raises environmental culture. We also discuss how environmental culture may lead to an Environmental Kuznets Curve. As always, comments are more than warmly welcome. Thank you! In Derbyshire there is a lake that has an exceptionably blue color, giving the lake its name “Blue Lagoon” (hat tip to Simon Robinson). The color is caused by caustic chemicals in the stones at the lake. These have led to a pH level in the water of 11.3 (ammonia has 11.5pH, Bleach has 12.6pH…), with dead animals floating inside and swimming in the lake causes ‘skin and eye irritations, stomach problems, fungal infections such as thrush, other infections such as rashes’. How in the world do you stop masses of people swimming in a beautifully blue but albeit toxic lake? a) you put up signs saying: if you swim in this lake you’ll get skin irritations and stomach problems. b) you dye the lake black. b) you dye the lake black. See HERE. But what do environmental economists learn from this? Firstly, the local government had tried possibility a) first, but to no avail. Still a large number of people came, just being attracted by the “un”natural beauty of the blue lake. So the government decided to change exactly what had been attracting the people in the first place, namely the color of the lake. Clearly, this shows that warnings of potential health hazards do not necessarily stop people from consuming what they enjoy. This is true for also e.g. smoking or alcohol consumption. What is even more surprising is that the health problems from swimming in the lake arrive nearly immediately, and people come from far away to swim there. Thus, warnings which have proven to be unsuccessful in stopping people from swimming in the lake are likely to be similarly unsuccessful when trying to stop smokers or alcohol consumers, where negative side-effects tend to occur in the further future. Now, what has proven to be a successful “environmental” policy was to dye the lake black, thus taking away what has initially attracted people from coming there. In terms of alcohol consumption or cigarette smoking, this would mean to worsen the taste of those products to the extent that noone wants to consume these. But here things start to get dodgy – my guess is that most readers would find the idea of dyeing the lake black a good one, since it stops people from hurting themselves. But a similar approach applied to cigarettes or alcoholic beverages would be viewed as being absurd by most readers, no? So why is that? Basically, if the government has no right to alter the taste of cigarettes or alcoholic beverages to the point that they are not consumed any longer, then the local government in Derbyshire had no right to dye the lake. But then again, no government would have the right to stop GM food, or require hazardous components in clothing or food components if they make the food keep longer or taste better, or the clothing look nicer. Thus, is this simply a problem of social acceptence, culture or norms – smoking and alcohol consumption being more socially acceptable than GM food or a hazardous lake? But if that is the case, then this would mean that all our environmental attitude or policy is fully dependent on social acceptence, culture and norms. What then says that one social norm or a specific culture is better than another and should be regulated accordingly? Or should we not simply allow those that want to swim in a toxic lake to swim in that lake, but inform them upfront of the potential hazards? Similarly with smoking and alcohol consumption, is informing consumers enough or should we actually go all the way and believe that consumers do not know what is best for them and consequently need to restrict their behavior? So there is actually a negative externality from dyeing the water black: When the water was blue, it was possible to see THEM floating up to you. Now, with the water having been dyed black, anyone that goes into the water will turn out to be an easy prey, since: They’re WAITING for YOU… just BENEATH THE SURFACE! Care for another swim? So here is an interesting concept in times of governmental debt crises and environmental problems: Debt-for-nature swaps (thanks for pointer to Professor Müller-Fürstenberger, Trier). Mean debt behold and be a goner! My money is clearly stronger. I make your sorrows drop! Does it work? Like always there are problems. E.g. deforestation in Brazil occurs to some extent illegally. If Mr Bill Gates does not prevent this additional deforestation even though he obtains the rights to a certain area of tropical rainforest due to the debt-for-nature swap, then nothing much is going to change. So there local institutions either need to be already in place or need to be put in place that also protect the endangered natural sites from illegal activities. Often, this is very difficult to control. Check out a report on this by the World Bank on this HERE. 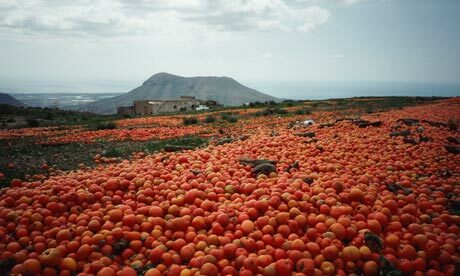 Surplus tomatoes are dumped on farmland in Tenerife, Canary Islands, Spain. So this should really slap you in the face. 1/4 of all food produced is lost or wasted. How does the WRI define food loss and food waste? So, I guess, what the report is trying to get at is that food loss is a result of inefficiencies on the producers’ side, while food waste is the due to consumer behavior and demand. For example, consumers prefer nice, good looking apples of the same sizes instead of mishaped ones with brown bits. At least, if they have the choice, then they will only buy those that look nice, while those other, “faulty” ones will not be bought and eventually will be thrown away. Thus, this is food waste. Food loss occurs, for example, because the apples need to be transported from Italy to Germany, and on the way a part of it gets crushed. However, the distinction between food loss and food waste is not always necessarily clear, since obviously the producers’ and the consumers’ sides interact on the market. So, if German consumers demand apples from Italy and a part gets crushed on the way, then the WRI defines this as food loss. While if German consumers demand local apples then maybe none gets crushed. So is it now negligence (and thus food waste) from the consumers’ side if they buy apples from Italy and a part gets squashed? They could have bought these apples from a German producer instead and thus prevented the squashing of the apples. Or is it food loss and should be attributed to inefficiencies on the producers’ side? What I am suggesting is that the distinction between food loss and food waste needs to be treated carefully, otherwise one closes doors for potential policies that only address the one or the other, for maybe the false reasons. In terms of regional distribution, the WRI report notes that “[t]he total share of food lost or wasted ranges from 15 percent to 25 percent across most regions (Figure 6). The oneexception is North America and Oceania, where loss and waste is approximately 42 percent of all available food.” In terms of calories per capita per day, North America and Oceania lose or waste twice as much as Europe or Industrialized Asia, and around three times as much as the rest of the world. It would really be interesting to know precisely why food loss is so much higher in North America and Oceania than in the ROW. Obviously, a greater food loss or waste will imply that it is more difficult to feed the expected 9.3 billion people in 2050. Food loss is likely to waste farmers’ income, but food waste not necessarily. The food loss, as discussed below, occurs mostly in LDCs – they are unlikely to have the money to improve efficiency. Thus, it may very well be the case that only rising income in LDCs will have the desired effeect on food loss. Food waste is a consumer side problem, and occurs mostly in rich countries. Thus, if the rich throw food away simply because they can afford to do so, then this increased consumers’ expenses is not really a problem for them. The poor cannot afford to waste food so do this very little. Also, food waste is not necessarily a problem for the poor and may even raise farmers’ incomes! Farm revenues are (price x quantity), and if the increase in quantity that goes to food waste is sufficiently larger than a (possible) price reduction due to the additional amount produced, then this raises farmers’ income. Furthermore, if demand increases further with a given quantity produced, then this may even raise prices and thus lead to an increase in farms’ income. Thus, food loss is a problem for farming incomes, but food waste largely a problem only for creating a sustainable food future. Food date labelling –> The “use-by” labelling is the “the last date recommended for the use of the product from a food safety perspective.” One suggestion here could be to adopt the “minimally-conservable until” labelling that is used in Germany. It is a less restrictive labelling in the sense that “use-by” is a hard constraint that basically says: Use latest until expiry date, because on the expiry date the food will not be edible anymore. In contrast, the “minimally-conservable until” label suggests: Ok, you should start thinking about eating this sooner rather than later. It provides a less rigid constraint on the date of consumption. Reduce portion sizes (in restaurants) –> this is unlikely to happen. Think about it – take two identical restaurants, one with a small portion and the other with a big one – which one would you go to? Another issue here is culture: In many Asian countries it is rude to leave an empty plate behind, as then this means that the person who invited could not feed everyone sufficiently. Changing this attitude in restaurants from the consumer side and the restaurant owner side will be extremely difficult. Some more random points: Quite interestingly, food waste seems to be positively correlated with income (see Figure 6 in report), while food loss is negatively correlated with it. Thus, food loss is likely to be a problem of storage costs, transportation problems, inefficiencies in the production-to-consumption chain. Clearly, assuming the causality runs from income via technology/management/infrastructure to food loss, then improvements in income for the LDCs should yield a double divident: poverty reduction and reductions in food loss. In contrast, since food waste seems positively correlated with income (which should be clear: if you have little money to buy food, then you are going to be much more careful with it), then simple increases in income are likely to only lead to a re-distribution of the problem – from food loss to food waste. Thus, both for developed countries and for LDCs that are growing quickly, a strong focus should be placed on the consumer side. are really not gender oriented but instead are household oriented or poverty alleviation. Tax the amount of food loss. This should increase efficiency at the production/transportation/marketing stage. An obvious problem is that this will be less effective in poor countries where producers simply cannot afford the expensive technologies or management options. Ask for significantly higher insurance rates for overweighted people. Just like it is the case for someone undertaking a dangerous sport, smokes or has a family history of specific diseases, the insurance industry could also raise insurance costs for overweighted. I think all this discussion about fairness is surprising. Obviously, there are some diseases or medication that lead to overweight. In these cases, insurance rates could be adjusted accordingly. Consumer attitudes: could be changed via implementing a sort of sport-oriented society, like it is the case in many European countries now. Sports, physical fitness starts to be a trendy thing. Overweightness less so. Relaxed living, taking time to dine out, reduces both stress and junk/fast food intake. giving incentives to the old local small stores: if you only need a minute to walk to your next bakery or local shop, then one will buy more on a need-for basis and not this bulk shopping. Less things will be pushed to the back of the refrigerator where it is only found because it already starts to walk by itself…..